Society has long emphasized science, logic and facts, at the expense of honouring feelings, instinct and intuition. Reconnecting with the spiritual world and tapping into our intuitions, Kenzo has created a vibrant constellation of bags of varying colors and textures, using the motif of the Eye on the clasp, a universal symbol of luck in many cultures. The name of this collection, TALI, comes as a derivative of the word “talisman”, a powerful amulet to the wearer, able to possess spiritual powers and bring good fortune. Throughout the collection, KENZO integrates clean design and elegant craftsmanship to each bag. You are invited to view the TALI collection to discover the bag that speaks to you. Read what your favourite color and bag says about you. Choose your bag, and let it transmit to the world the true “you” when you wear it. Let the KENZO eye protect you and celebrate the real you with the TALI web application featuring collaborations with the queen of astrology, Susan Miller and surreal artist Filip Custic. 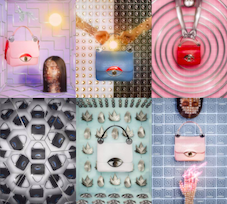 The one-of-a-kind website (OPTIMISED FOR MOBILE) takes form as a KENZO TALI bag “wheel-of-fortune” where visitors are confronted with a KENZO universe designed by Filip Custic. Visitors can then spin the wheel and discover the writings of Susan Miller who explains each TALI model’s unique properties and how the bag may be best suited for them. Carol Lim & Humberto Leon, co-creative directors of KENZO, presented the TALI bag during their bright, colourful and energetic Fall/Winter 2019 show in Paris in January. Now a core selection of key colours and styles have been made available for purchase in advance of the full worldwide launch in September. From April through to August, the house plans to offer multiple styles to KENZO fans in key global cities – Paris, Shanghai, London, Madrid, Tokyo, Dubai, Milan and more – and even offer city exclusives, where certain styles will be available in select stores first before the rest of the world. TALI stands for “talisman”, an object that is thought to have magic powers and to bring good luck. At KENZO, our talisman is the eye. Introduced by co-creative directors, Carol Lim and Humberto Leon at the Fall/Winter 2013 runway show, this universal symbol of awareness and spiritual awakening has remained and now adorns the new TALI accessories collection as a central motif. Signifying both power and protection, the eye, both literally and figuratively, unlocks each and every TALI bag. A new KENZO icon, the TALI bag was unveiled in a myriad of bright colors at the Fall/Winter 2019 show in Paris. Premium leather finishes distinguish each TALI with its own textural flair, as KENZO explores new treatments from smooth calfskin in block colors and seasonal prints to embossed water snake and crocodile, saffiano scratched leather, and an exclusive eye-shaped quilted lambskin. For Fall/ Winter 2019, two seasonal prints depict a graphic sunrise and a KENZO logo tiger motif. These rich treatments are complemented by custom hardware throughout, starting from the innovative eye clasp finished in bright palladium or with a scratch-resistant matte black PVD coating. The eye clasp opens with a single touch of a black convex button, its 3D structure accented by the raised eyelid embellishment in contrast resin. With an instantly identifiable shape, the two square (MEDIUM) and rectangular (LARGE) TALI styles feature adjustable straps, transforming the TALI from a handbag to a shoulder bag to a crossbody. These interchangeable straps are connected via two circular hinges in polished palladium embossed with KENZO PARIS, becoming jewel-like hardware details that add to the TALI’s playful architecture. The TALI’s spacious, double-gusset design with suede-effect lining contains an external magnetic pocket and internal zip pocket for multiple storage options. Each TALI is presented in its own custom moulded box and white cotton KENZO dust bag.